The club/theater shows will feature a 30-minute opening set with Duane Betts using his go-to guitar player, Johnny Stachela, and Devon Allman’s rhythm section. 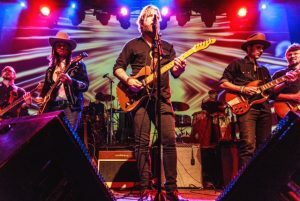 After a 15-minute break, the Devon Allman Project will play a one-hour set which will include songs from Honeytribe, Royal Southern Brotherhood, The Devon Allman Band, and a few covers. The night will culminate with 30-minute plus an encore featuring all eight musicians playing Allman Brothers Band tunes and other classics. Festival dates will be a straight 90-minute set.